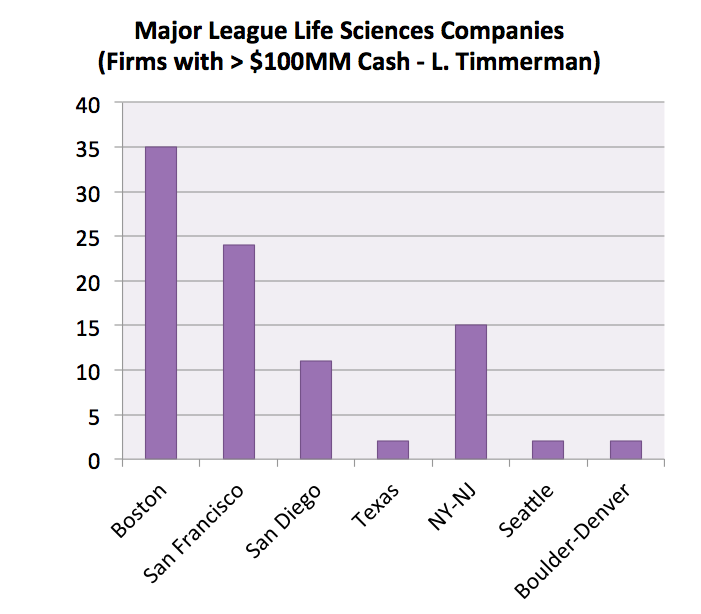 Luke Timmerman from Xconomy has published an analysis of where the major Life Sciences companies are located. 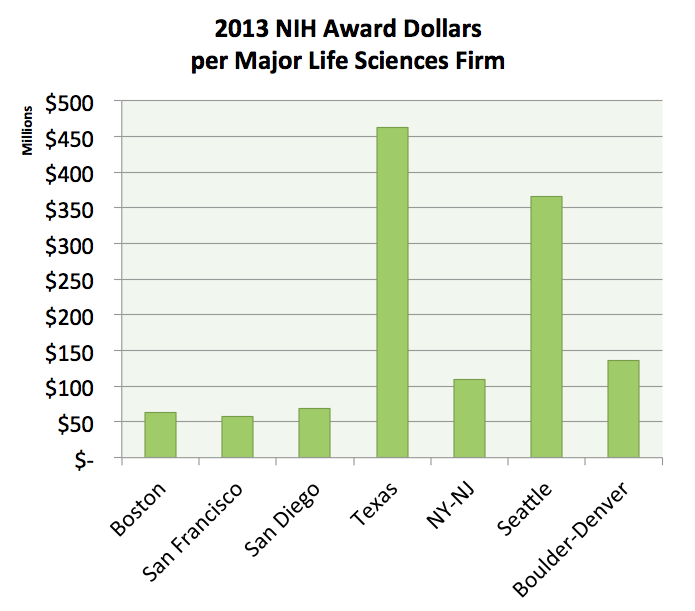 Using the criteria of having $100 million in cash and short term assets as the definition of a major firm, his analysis highlights what many observers have been noticing anecdotally — the Boston-Cambridge cluster is hands down the largest and fastest growing innovative Life Sciences hub in the U.S. (and thus the world). From 2003 to 2013, the number of major Life Sciences firms headquartered in Boston grew to 35, an astonishing growth rate of 192%. The next largest cluster, San Francisco, has 24 firms (growing 21% since 2003). And Boston’s count of companies doesn’t even include the major big pharmaceutical research centers that have sprung up in the last decade, but with corporate headquarters located elsewhere. 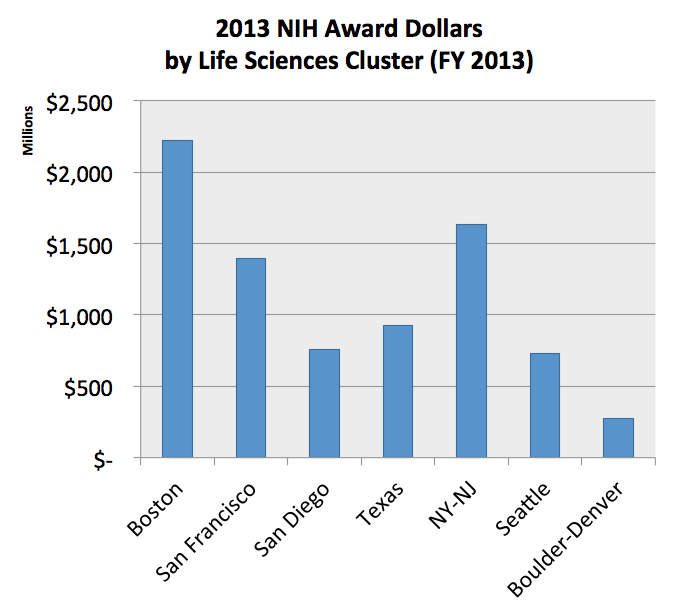 If you think of NIH dollars as investments in the pharma/biotech industry, Boston-Cambridge, San Francisco, and San Diego stand out as being the three regions that are the most efficient — all three host about one major life sciences firm for every $60-70 million in regional annual NIH funding. Considering that each one of these firms have at least $100 million in cash alone, and are worth many billions of dollars in aggregate, it looks like it’s been a pretty good investment. Will the Boston area’s growth continue? The number of construction cranes on the Cambridge skyline would indicate yes, but the ecosystem is surprisingly delicate. Some of these firms may not succeed. 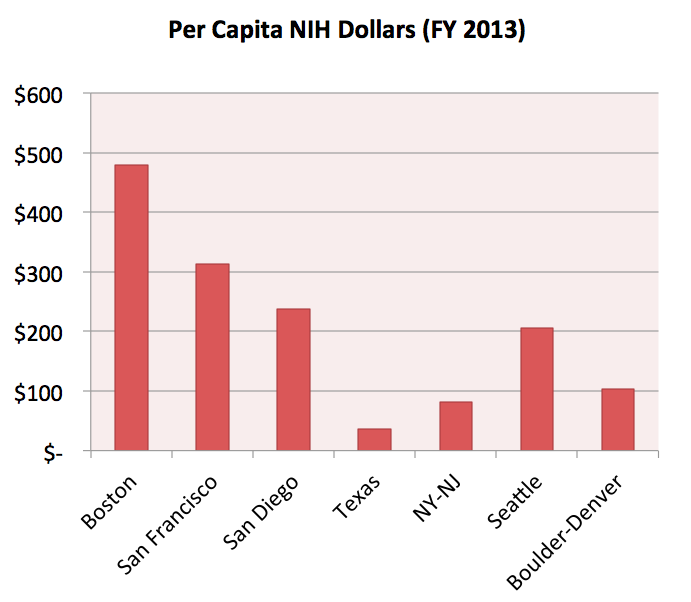 Rents are rising, the metro area is quite congested, and of course the fiscal mess in Washington threatens the long term health of biomedical research funding. For now, however, the boom (bubble?) is on. This entry was posted in Innovation, Research and tagged Biotech cluster, Boston, Life sciences, National Institutes of Health, San Diego, San Francisco, Venture capital, Xconomy. Bookmark the permalink.